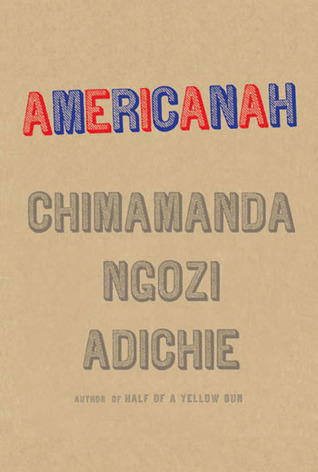 Today I'm featuring Americanah by Chimamanda Ngozi Adichie, borrowed from the library. Beginning: Princeton, in the summer, smelled of nothing, and although Ifemelu liked the tranquil greenness of the many trees, the clean streets and stately homes, the delicately overpriced shops, and the quiet, abiding air of earned grace, it was this, the lack of a smell, that most appealed to her, perhaps because the other American cities she knew well had all smelled distinctly. Philadelphia had the musty scent of history. New Haven smelled of neglect. Baltimore smelled of brine, and Brooklyn of sun-warmed garbage. But Princeton had no smell. She liked taking deep breaths here. She liked watching the locals who drove with pointed courtesy and parked their latest model cars outside the organic grocery store on Nassau Street or outside the sushi restaurants or outside the ice cream shop that had fifty different flavors including red pepper or outside the post office where effusive staff bounded out to greet them at the entrance. She liked the campus, grave with knowledge, the Gothic buildings with their vine-laced walls, and the way everything transformed, in the half-light of night, into a ghostly scene. She liked, most of all, that in this place of affluent ease, she could pretend to be someone else, someone specially admitted into a hallowed American club, someone adorned with certainty. Page 56: "Each time Ifemelu came to Kayode's house, she imagined what it was like to live here, in Ikoyi, in a gracious and graveled compound, with servants who wore white." My thoughts: This book was chosen for one of my book clubs, which meets very close to Princeton, New Jersey. When considering this novel, we found the opening paragraph amusing, and were drawn in by the synopsis. From Goodreads: From the award-winning author of Half of a Yellow Sun, a dazzling new novel: a story of love and race centered around a young man and woman from Nigeria who face difficult choices and challenges in the countries they come to call home. Friday Focus: The Friday 56 & Book Beginnings was originally published by Catherine for bookclublibrarian.com. This post cannot be republished without attribution. Retweeting and sharing on Google+ are encouraged and appreciated.